Earlier this week I posted a page pointing to the many laboratory wall charts offered by Keysight Technologies (formerly Agilent, formerly Hewlett Packard). 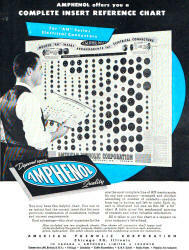 I mentioned how unlike modern charts that are full of color, the old ones were usually a single color or black & white. 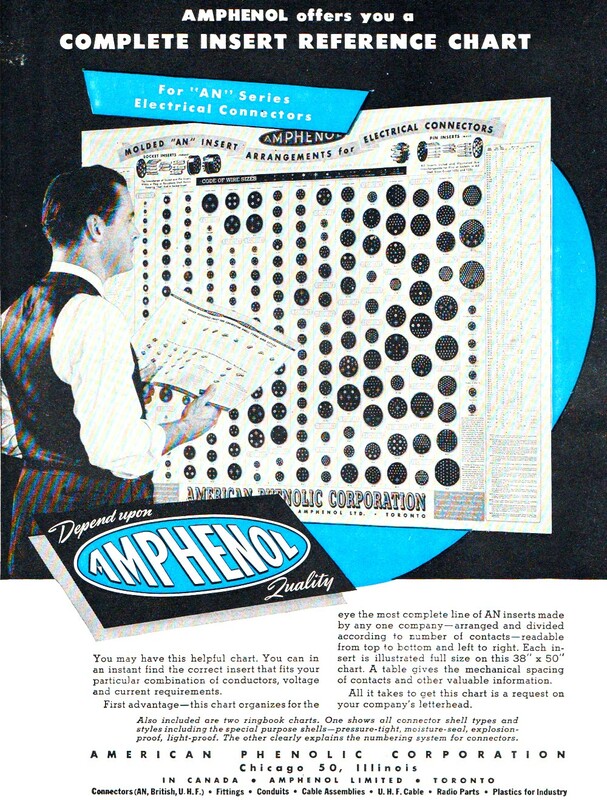 Here is an example from American Amphenol in the mid 1940s. Something like this would make a really cool decoration for today. I just looked on eBay and didn't see an Amphenol Tube Socket Wall Chart for sale, but that would probably be the bet place to latch on to one eventually. You may have this helpful chart. You can in an instant find the correct insert that fits your particular combination of conductors, voltage and current requirements. First advantage - this chart organizes for the eye the most complete line of AN inserts made by anyone company - arranged and divided according to number of contacts-readable from top to bottom and left to right. Each insert is illustrated full size on this 38" x 50" chart. A table gives the mechanical spacing of contacts and other valuable information. All it takes to get this chart is a request on your company's letterhead. Also included are two ringbook charts. One shows all connector shell types and styles including the special purpose shells - pressure-tight, moisture-seal, explosion-proof, light-proof. 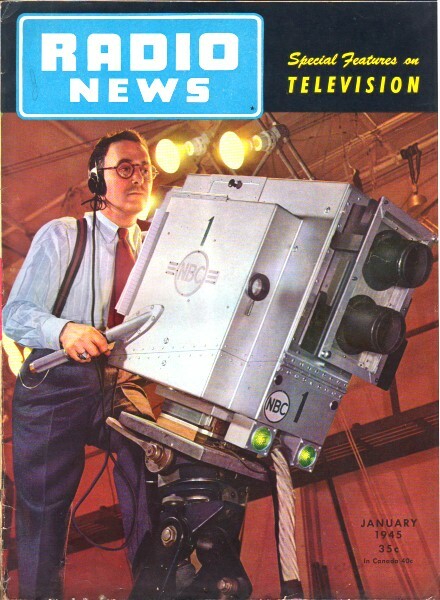 The other clearly explains the numbering system for connectors.